It’s been one year since I’ve started this new place of the day project and I wanted to pick an extra nice new place. 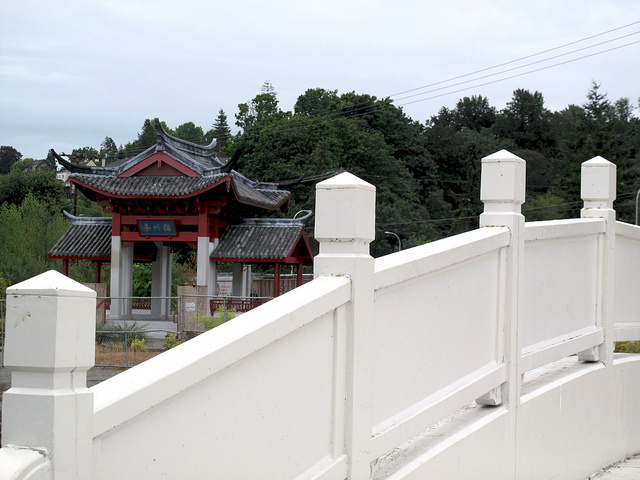 I was going to go to the Pacific Ocean, but it was just too darned rainy and cold, so instead I went to Pagoda in Chinese Reconciliation Park at 1741 N. Schuster Parkway, Tacoma. 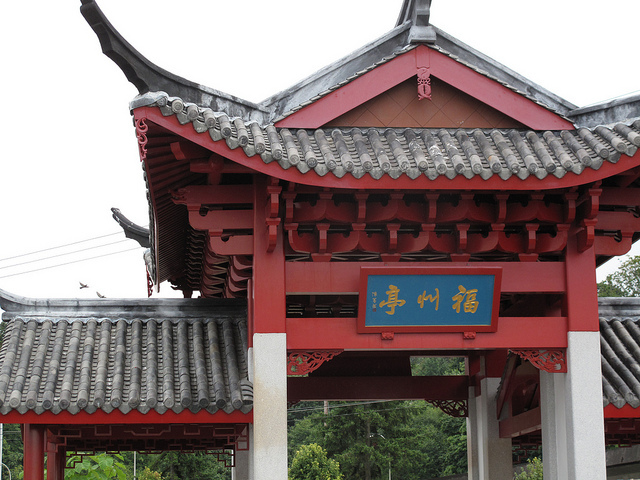 The pagoda is a gift from a gift from Fuzhou, one of Tacoma’s sister cities. Apparently there was some vandalism on the building in May 2011 and now perimeter fencing is in place until security cameras can be installed. The pagoda, called a ting, will be open to the public in mid-September. The park also contains the Bridge of Pearls footbridge, which is accessible. 257 of my new places are in Tacoma. Lakewood, with 18 places came in a distant second. Tacoma has some pretty darned interesting places! Lots of art and history in T-Town! My most popular type tag is restaurants (85), followed by Art (77) and then History (56). Some of the places I checked out alone, but I often brought my husband, daughter and occasionally dogs along for company. They are good sports about the whole thing. I did miss a couple of days. There were a few days that I was sick and the weather was bad and there was that week I took a time consuming class (yes, I passed). The world didn’t end. 30 places were tagged “their future is in question”. Of these 13 have had a change of use and several more remain vacant. My strangest place was probably the sky. Tacoma has some pretty darned interesting places! Lot of art, history and stories here. It’s been good for me to visit a new place everyday and I’ve started keeping a list of potential place. I now carry my camera with me 98% of the time now, though sometimes it is easier to use my phone. I’ve come to admire all of the folks that do a 365 project! The encouragement that I’ve received along the way has meant the world to me! Thank you! This entry was posted in Art -- there is art here!, Parks, Tacoma, WA State - Pierce County and tagged 365, Bridge of Pearls, Chinese Reconciliation Park, Fuzhou, observations, pagoda, Project, Schuster, sister city, thoughts, ting on August 23, 2011 by admin.